I simply love this blanket, warm soft and always cozy!! I would buy over and over if needed. MAXIMUM COMFORT: Perfect for Twin, Twin XL, Full, Full XL, Queen, and King beds, couches, camping, flights, or traveling! PREMIUM HYPOALLERGENIC YARNS: Expertly crafted with premium quality poly-fiber yarns that create an exceptionally soft and durable blanket. This blanket is anti-pilling, wrinkle free, and hypoallergenic. Great for those prone to allergies and asthma! COZY AND WARM: Our design keeps you cozy warm even on the coldest of winter nights but also breathable enough to use during the warm summer months. Designed for year round use! EASY CARE AND SAVE MONEY: Machine washable in cold water with similar colors. Dries quick on tumble dry low temperature, no ironing or expensive cleaning required! 1 Blanket 50" x 60"
1 Blanket 62" x 92"
1 Blanket 90" x 90"
1 Blanket 108" x 90"
Great blanket. Very warm and perfect for cold winter months. This us a very warm blanket that I use on my bed on those extra cold days. I chose the queen size blanket so I don't have to worry about it not covering me while I'm sleeping. Blanket is so soft and warm...I love it! Very nice quality, soft, very comfortable and wash and dry very nicely. This blanket is a big disappointment. Over the years, I have bought nearly a dozen plush fleece blanket and really loved them all. I bought this dark green blanket to replace one that had worn out. When I opened the package, I was pleased because the color was exactly what I was looking for, but when I started to take the blanket out of the package, I realized it wasn't plush at all. 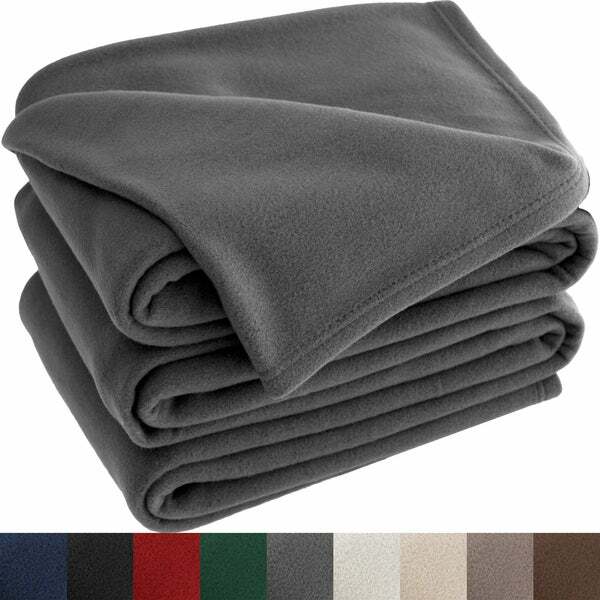 It was plain matte fleece like that used in a hoodie, not like any of the fleece blankets I had bought before. I considered sending it back, but it was too much trouble as I prepared to head south for the winter. I'll just toss it into a closet and use it as a spare if I need it. I honestly try hard to give everything a chance. There is seriously NO HOPE for this blanket! It feels like wool. It’s scratchy and the ivory color looks like the type of yellow you’d see on a “nicotine” stained item of any kind. It’s $17.50 to return. Always have great luck with Overstock items, not this time. I ordered the California King blanket as picture and description listed and was shipped a regular king blanket..... totally different sizes people!!!!! For the price I expected better quality, it is thin and not as soft as the description. But the cost to send back wasn't worth it so I kept one and gave one away. SOFT! Nice blanket to snuggle up on the couch with on those rainy days. Haven't washed it yet so we shall see how well it holds up when I do.. Very soft. Pretty color (ivory.) It's not overly heavy but warm. This was a gift and the recipient was quite pleased. It appears that it will provide some warmth in the winter. Extremely soft and warm. I love the way it feels. Very good quality! What can I say. This blanket is stiff. Even after washing it. None good to say. This blanket is so soft and cuddly that I ordered myself another one! I love to wrap myself up in the blanket while I'm watching TV or just curled up in my cocoon chair. This blanket is a great value for the price do not hesitate to buy one. This is the most softest blanket. I love it! I had one but gave it. to my mother. Because it's exactly what I am looking for. Like the fleece material and color. Wanted green blanket for the holidays! I didn’t want to over do the Blankets is why. Price, and I needed new blanketsfir my new home. "What are the dimensions of the throw?"